Why and how to read the charts in Retention report. These show amounts of active (based on Intercom's Last Seen attribute) users / companies in the past 1, 7 and 30 days. These show amount of users / companies active in certain period. E.g., if user visited your app on 31 Aug and 02 Sep, he will count towards corresponding days, 29 Aug - 04 Sep week, and towards August and September. Note: we cannot show this data for dates before you signed up with Statbot - it is simply impossible to get this kind of information from Intercom retrospectively. Cohort analysis let you see a more complete picture of how your subscriptions evolve over their lifetime. If you keep your Users/Companies active months later. It answers the question, are my Users staying active, if so, how long? Great way of seeing how changes you do in your product affects Users retention in the long term. It's calculation is based on when Users was Last Seen in your product. The first column from the left is the given month. We calculate cohorts 1 year back, so there's 12 rows. The second column shows total amount of users that signed up in respective month. Next 12 columns represent months after the given month, and each column shows how many users from the second column were active in each month. E.g., 100 users signed up in Oct 2015; 90 of them were active in Nov 2015, 70 were active in Dec 2015, 80 were active in Jan 2016. Cohort will show 90% (or 90) in column 1, 70% (or 70) in column 2 and 80% (or 80) in column 3. Now, since you are familiar with how cohort should work, we have a confession to make. 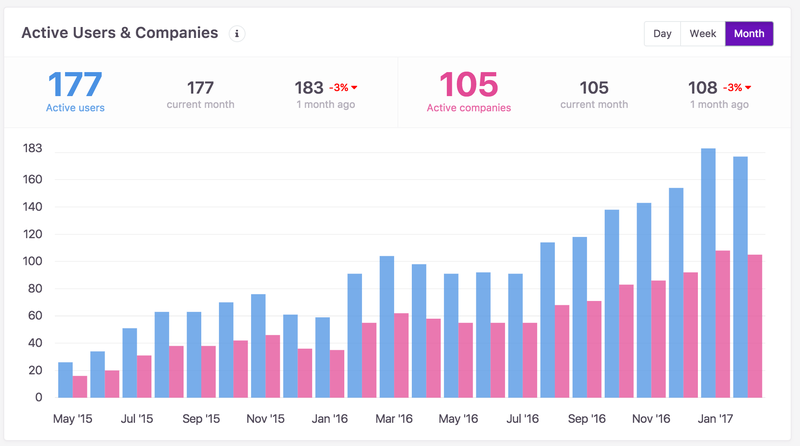 To build the cohort discussed above, we would need the same historical data we use for active users/companies. So, to be able to build cohorts from the day 1, we use certain simplification. We consider that if user was active in month n, then he's been active in months [1..n-1] too. That's why you'll always see non-strict monotonic decrease in the cohort numbers, e.g., 100% -> 85% -> 65% -> 65% -> 50%. This means that sometime cohort numbers will not be totally accurate, and that they can change retrospectively. E.g., a 100 users signed up in a certain month. In month 1 half of them were active -> 50%. In month 2 the other half were active -> 50%. But since we consider that they were active in month 1 too, its number will change from 50% to 100%.